Hunting, fishing, camping, and off road ! 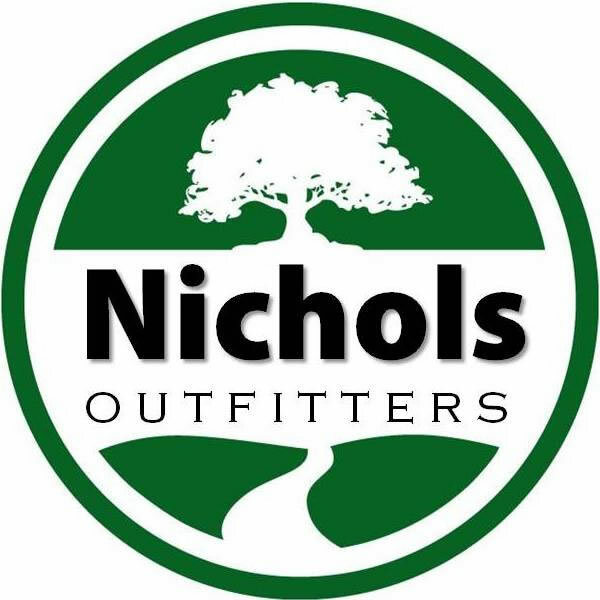 Outdoor enthusiasts, construction sites, travel, and more. Use it on the coast or the plains, the mountains or the hills. Use in Disaster Relief, Hurricane and Earthquake preparedness, and other situations where a sanitation situation may occur. Use Hitch Mounted or Stand Alone. You can use the Bumper Dumper® as a stand alone unit as well as hitch mounted. Here is the Bumper Dumper® as a stand alone unit using a 5 gallon bucket lined with a kitchen trash bag. Made in For extra back end support you can lean the back of the frame against a tree or some stable object. with special emphasis on pickups and sport utility vehicles. We'd surely appreciate it ! circumference of a 5 gallon bucket easily slides into the attachment grooves underneath the frame. If they don't have it tell them to get it! Easy Online ordering now available. Click here. Has this happened to you? You're at the campsite or in the middle of nowhere and suddenly nature calls. What do you do? You squeamishly go looking for a quiet spot behind a bush to do your thing. You cautiously avoid the poison oak and ivy. As you carefully squat down and try to relax a snake suddenly comes slithering through the weeds and startles you. What a mess! 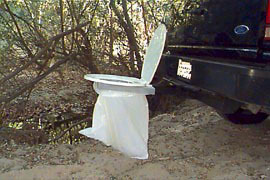 Now when nature calls you can go in comfort where ever you are with the one and only Bumper Dumper®. No more looking for the right spot, no more trying to balance while squatting, and no more surprises from creepy critters. 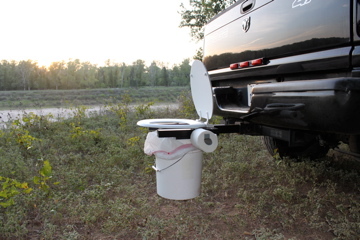 Just park your vehicle in a nice secluded spot, plug the Bumper Dumper® in to your trailer hitch receiver, and VOILA!! A portable toilet sturdy enough to hold 500 lbs. and just as comfortable as using the bathroom at home. You can even set up a privacy screen for complete comfort. You're driving on a long secluded stretch of road. You and the family had a big dinner at the last restaurant about an hour ago and someone's gotta go. "Can you hold it till the next stop", you ask. You drive a few miles and the sign says next station 90 miles ahead. Meanwhile, she tells you she needs to go too, but she can wait till the next stop. You keep driving a while and find yourself starting to feel the urge as well. By this time everyone is getting pretty anxious. You finally see the exit to the station and the brain kicks in. Everyone knows it's almost time for relief. You quickly exit and pull in to park. You get the restroom key from the attendant and hurry to open the door. You open the door and see this!!!! 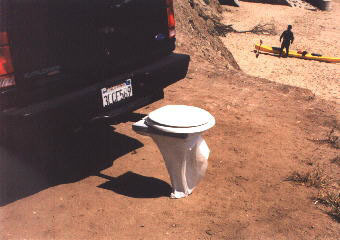 At one time or another you'll wish you had a Bumper Dumper®. It's great on those long road trips. The Bumper Dumper® is light weight and stores easily. Now you have a safe and sanitary alternative to those road side nightmares. 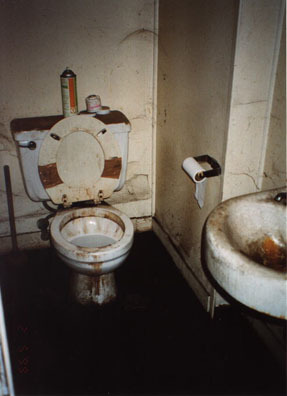 You can be assured of a sanitary place to go wherever you go. Take it hunting, fishing, camping, boating, vacation, on the job, in the field, or anywhere you may need to go. 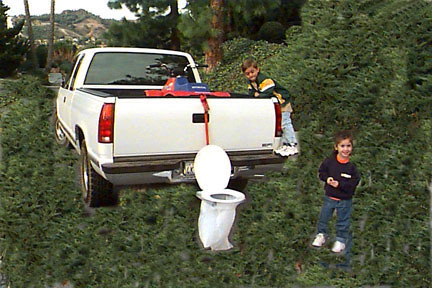 The Bumper Dumper® is great to have anywhere you go. No other portable toilet can compare to the support, stability and comfort that the Bumper Dumper® offers. 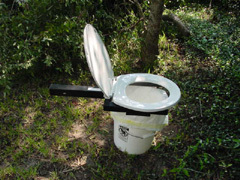 The frame is made from quality steel and comes with a standard size toilet seat. It's the only portable toilet you can use your own seat on. Almost any standard size toilet seat can be mounted to the frame so you can attach a padded seat or the favorite seat of your choice. 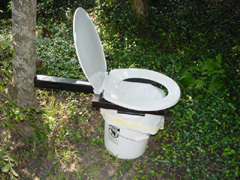 The Bumper Dumper® will last a long long time and it's light weight and so easy to use. If you have a trailer hitch receiver and travel or engage in outdoor activities where restrooms are far and few in between the Bumper Dumper® is a must have item. 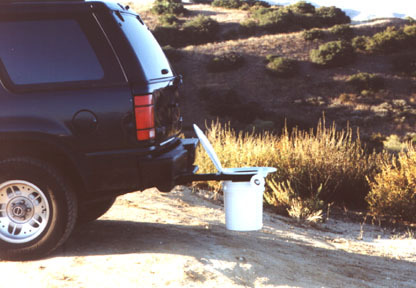 When traveling just pull off to a secluded spot and plug the Bumper Dumper® into the hitch receiver. No more having to wait for the next unsanitary rest area. T Shirt Collection with the first edition Booger Family T Shirt.